There are more than half a million small businesses in the state and they make up 99.4 percent of Indiana's businesses. INDIANAPOLIS — There are more than half a million small businesses in the state and they make up 99.4 percent of Indiana's businesses. According to statistics from the U.S. Small Business Administration's Office of Advocacy, small businesses employ more than 1.2 million Hoosiers. Small businesses spark the flame of the local economy. The Indiana Chamber of Commerce says the state of Indiana is a great place to set up shop and give some love to your business dream by saying "I do" to the help of local resources available for entrepreneurs. Young Colling, for instance, made a commitment to her passion of coupling Indianapolis brides with their dream wedding dress. "For me, it is never a dull moment, every bride is different," Colling, the CEO of Marie Gabriel Bridal Couture in Indianapolis, said. "I think I like that challenge. That every bride is different, my days or as short as, my long ten hours, sometimes it can be a one hour, I love that." After working in the corporate world of the bridal industry on a national scale for several decades, Colling noticed a void in the Hoosier state. "I used to work for the national bridal company, running a retail bridal stores, and then I retired from it," Colling said. "I saw the need for modern chic and more global bridal salons in the state of Indiana, so there was a very necessity I felt because I used to travel all over the Midwest to the south. And I always saw that we were missing that spot." Colling tied the knot of opening her own local bridal shop nearly seven years ago, with the help of her daughter, Anne-Marie. Now the two have three different bridal stores in the Indianapolis area. "I didn't mean to actually involve with my daughter, somehow her assistance became invaluable," Colling said about partnering with her daughter. "She has the young mind that I needed so she put together the business plan and then we really got involved in our profession in our city." 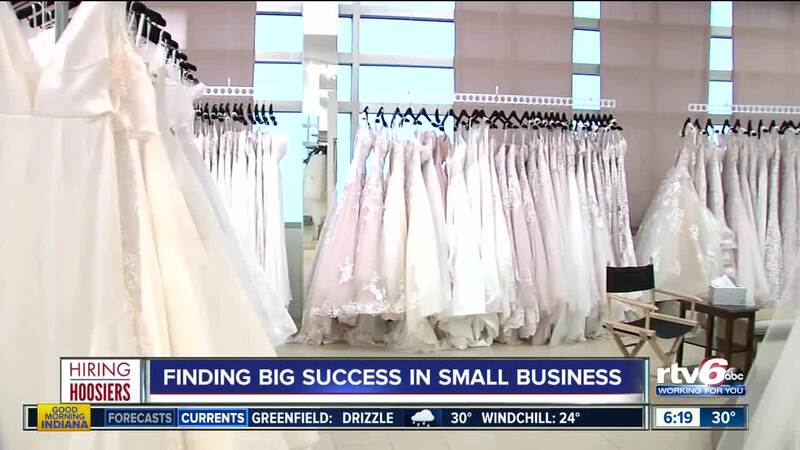 Just as you can say yes to your dream dress right here in Indianapolis, you can say yes to your dream job with the help of local resources to help get your business down the aisle. "Don't go it alone, go find that help that you need to get started, that help to continue to thrive," Tom Schuman, with the Indiana Chamber of Commerce, said. Schuman says the chamber is prepared to help your small business thrive. He also recommends to start with the Small Business Development Center, where they have experienced entrepreneurs at ten different locations across Indiana who can provide guidance. Also, Schuman says to utilize INBiz, a government resource that can aid in the technical and legal side of opening a new business. "About half of small businesses survive five or more years, then when you go between five and ten years, about a third make it ten years," Schuman said. "It is a challenge, it is not easy. But, any small business can be successful anywhere, I think it is more the preparation the person or company does, making sure they are filling a nitch." A nitch, is exactly what Colling saw to fill, with the demise of large-scale bridal stores across the country. "The huge box bridal stores, why are they failing? Because, just simply, the, it becomes a number, it doesn't become that love," Colling said. "This business, we truly need hands on and love. We may not do humongous like other big box stores do, however, the genuine success is the bottom line, we deliver the bottom line because we are hands on and we watch everything we do." Colling and her daughter plan on celebrating plenty more anniversaries of their bridal companies, with whatever ups and lows come with it. "You got to love what you do, doing your own business is long commitment, there will be bad days, bad weeks, bad months," she said. "In this business, I can sew, I can create, I can sell, I can clean, I can scrub toilets, I can do anything in my business by myself. If you are not ready for that blood and tears, if you are not ready for it, I don't think it is easy for you to do your own small business." The bridal shop CEO says the key to her local success is keeping to her true vision and doing what she truly loves every day. "You got to deliver professionalism but with true love and care, at every individual, at every bride that comes to my salon, truly I take it as she is one of my princesses, my daughter, every one of them," Colling said. "That never changes."